I love to race! I love having a goal to work towards. I love seeing improvement from one race to the next, be it mental or physical. I love competing in running, although in regular life I'm not nearly as competitive. I love the feeling of setting my sites on someone and passing them. 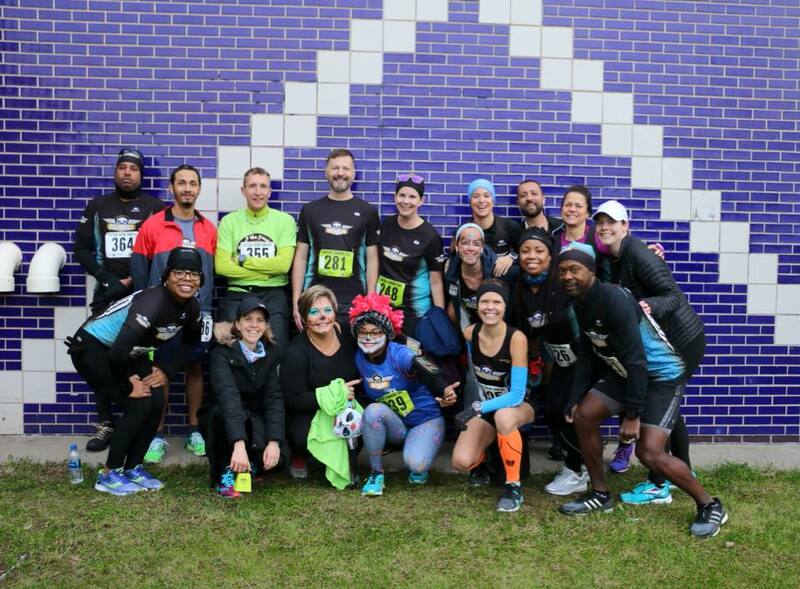 I love lining up with hundreds and thousands of other runners, all with different motivations, all with the understanding that we're there to do what we love, together. And I'm grateful for the opportunity to beat down the demons that tell me I'm not good enough, strong, enough, or tough enough. I'm mentally, emotionally, and physically tougher than when I started running when I was 14 and it's empowering to know that I can continue to grow stronger. 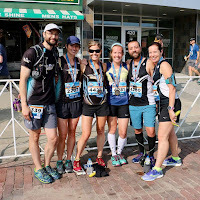 Great Lakes Relay with the RUNdetroit Flight Club team! 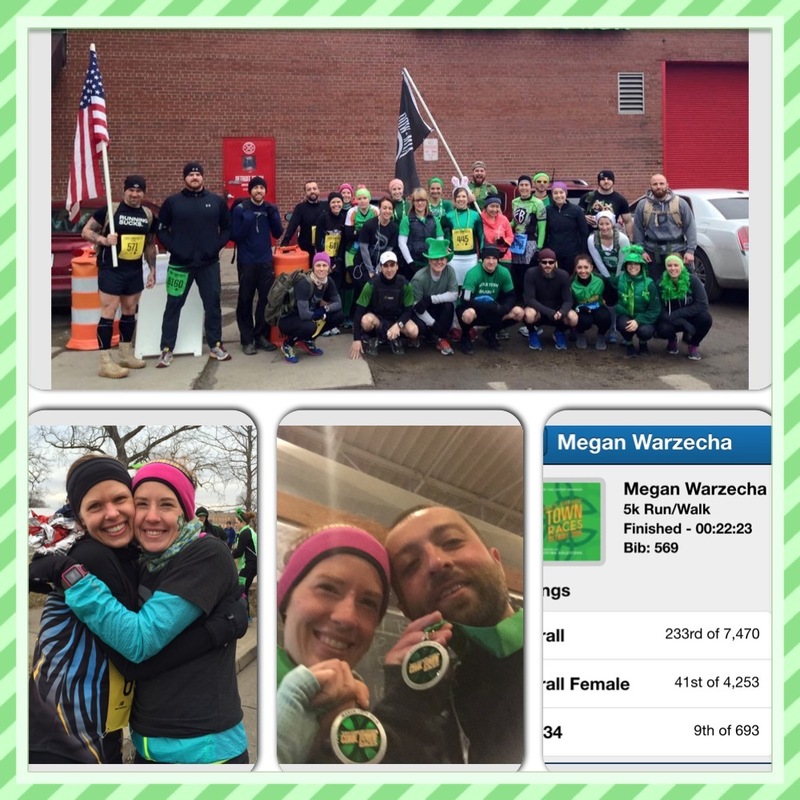 St. Patrick's Parade Corktown 5k, Detroit, MI - 21:43. Third in my division. Fun tradition with friends. Jason tested out drinking a shot at Mudgies before running a 5k. It didn't NOT work. Rock CF Rivers Half Marathon, Grosse Ile, MI - 1:40:42. This was a tough one for me. Humbling. Still bothers me a little, nine months later. But I think disappointment is a good feeling to dig into. Could be that this was my PR race a year ago. Could be that I was just disappointed I had a bad day. Legs just weren't there. Paces felt so fast. Wouldn't have made it if Eric hadn't joined me at the relay exchange. For such an individual sport, running is, more often than not, about community. 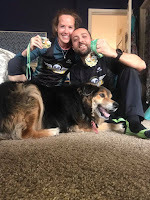 Mercy Health Glass City Marathon, Toledo, OH - 3:32:15. PR AND BQ+2:45! Full race recap here. 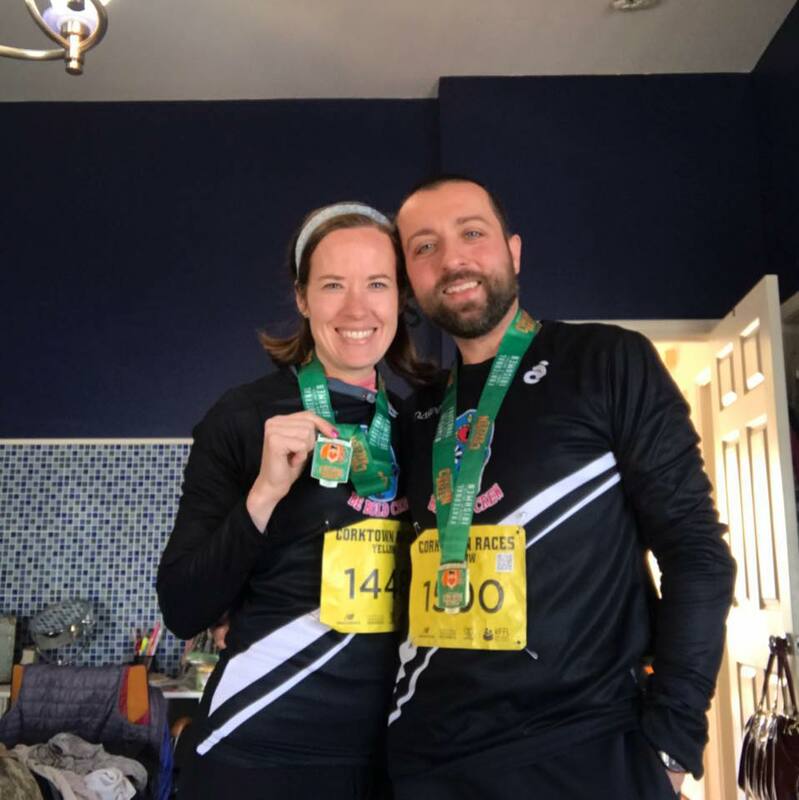 My BQ time didn't qualify me for the Boston Marathon in 2018. Last year, a BQ+2:09 would have done it. The most it had ever been since 2012 was BQ+2:28. For 2018, it was BQ+3:23. I was disappointed. I was sad. I was angry, although not really at anyone in particular. But, with a little perspective, I can call it a gift. 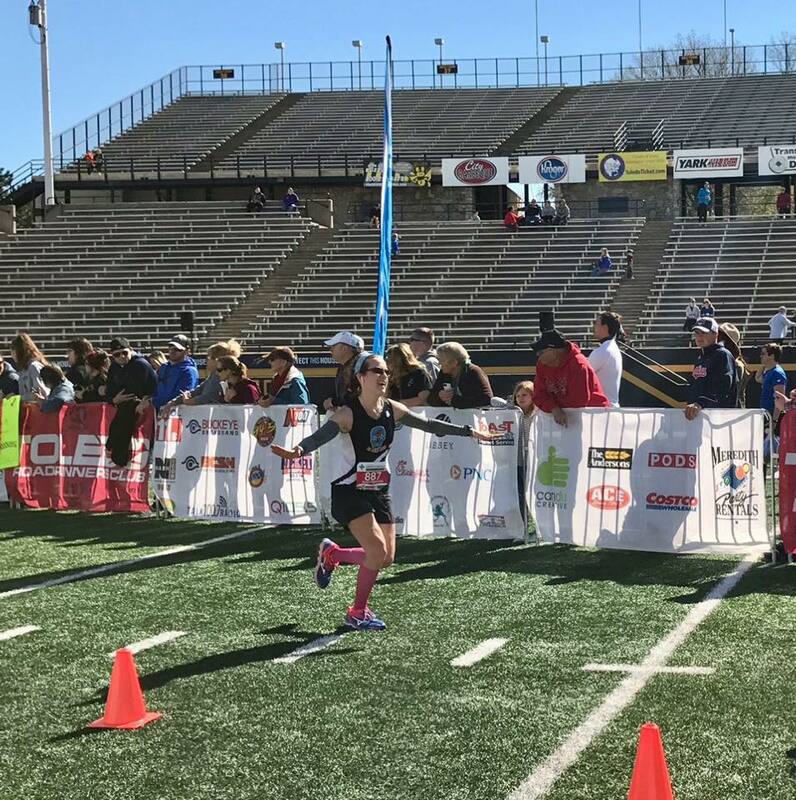 It allowed me to pull back from the BQ-chasing and see qualifying for Boston for what it really is to me. Yes, I want to run the most iconic marathon in the world. 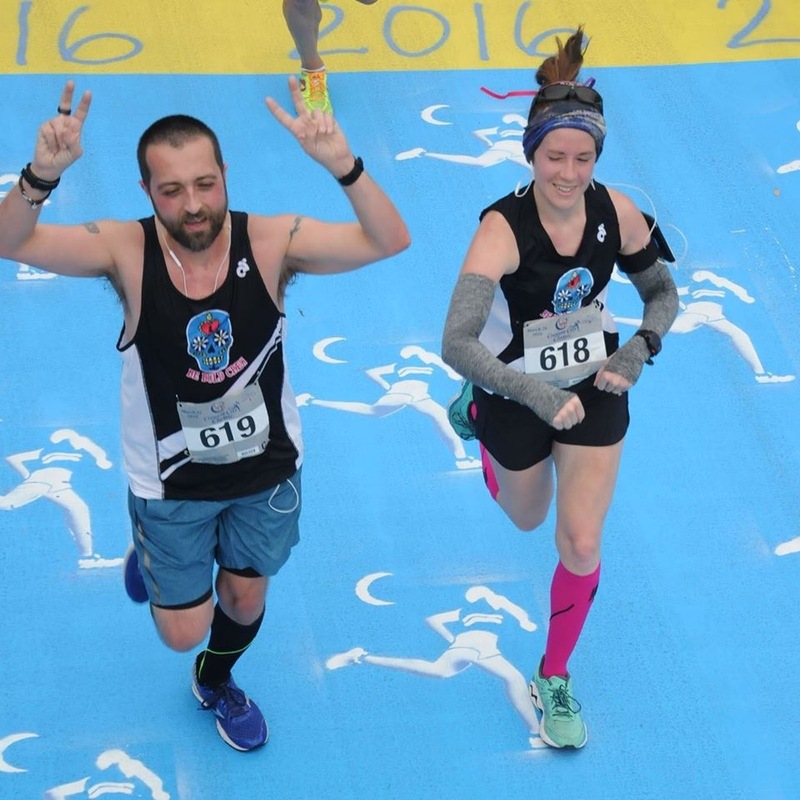 I want to be able to say I'm a Boston marathoner. But I've already qualified twice. And, at least for now, that's enough. I'm happy to go back to slowly, healthily, strongly chipping away at my 26.2 PR. And if, one day, my journey leads me to Hopkinton, it will be because it's the right time in my running journey. 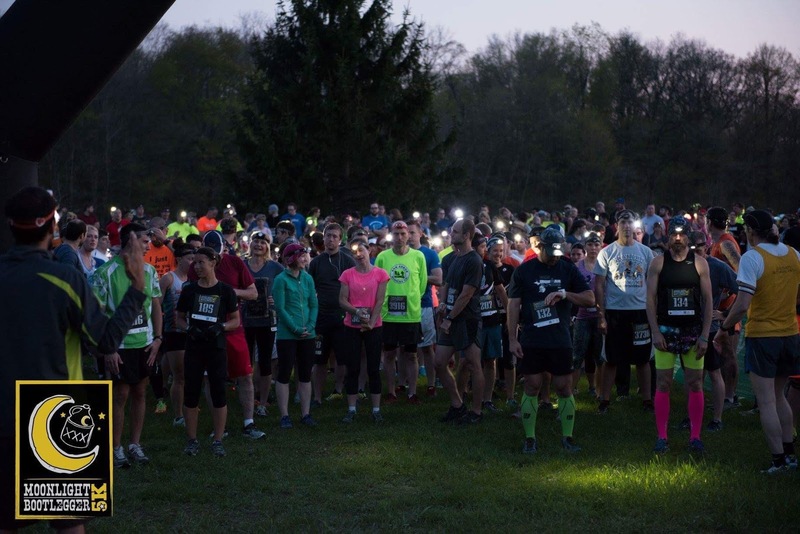 Moonlight Bootlegger Trail 5k, Northville, MI - 22:28. As always, super fun! Low stress, no expectations, running in the dark on trails with headlamps. Fell twice. 1st in my AG. Didn't light my hair on fire with the AG award. Moonshine in mason jars. Success. HAP Crim Festival of Races 10 Mile, Flint, MI - 1:14:12. Didn't have high expectations going into this one. I'd been so tired in the weeks leading up to the race. As usual, low expectations produced positive results. Didn't go out too fast, finished strong. Love those hills! They keep it interesting and I felt STRONG passing people on them. Beautiful course, great weather, well-organized race. And my final time made me feel confident for Chicago. American Home Fitness Detroit Women's Half Marathon, Detroit, MI - 1:37:32. AG win, 6th OA. Indication of good fitness for Chicago. HOT, SUNNY, and HUMID. Boring course. Never really had anyone to run with or chase. So, even happier with the results. Additional 7 miles with Amanda after the race. Tailgating mimosas with Jason afterwards! Won't run this one again. Too expensive to justify against the list of negative aspects. Bank of America Chicago Marathon, Chicago, IL - 4:19:27. First time I've typed that time. Yep. A full 47:12 slower than my April marathon. Full race recap here. Loved this race so much. Loved training all summer with Amanda. Running it again in 2018. 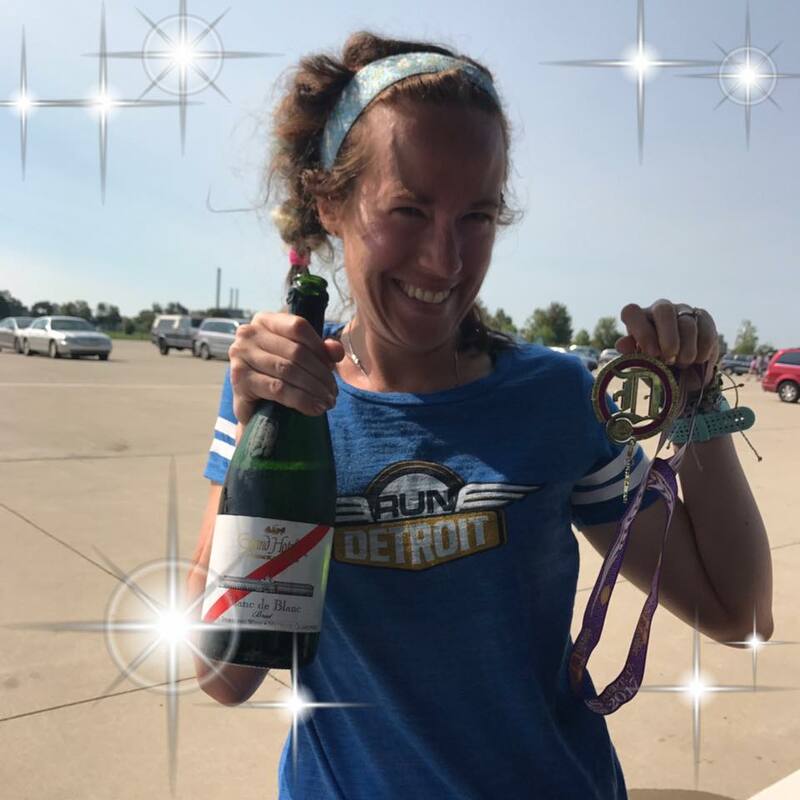 Detroit Free Press/Talmer Bank Marathon 5k, Detroit, MI - 21:46. 2nd AG, 10th OA F! And there were some speedy girls out there! Again, no expectations lead to fun running. Chicago was the weekend before, so I couldn't run a longer distance, but I couldn't miss FREEP weekend with Jason! I didn't run for the five days leading up to the race and figured I'd just see how I felt. I felt goooooood. Ran with a smile, felt strong, kicked it in, and passed people. So fun! And this is the only way I'll ever earn a FREEP AG award, so that's awesome! Run of the Dead 5k, Detroit, MI - 22:13. 2nd OA F. First race as part of RUNdetroit Flight Club! Not sure what happened here. Went out too hard and died? Tired from fall racing? Shouldn't have had La Feria (Spanish tapas) the night before? Probably all of the above. The plan was to race hard. I felt like I always played it too safe in a 5k. Went out too easy. Wanted to see what happened if I went out hard. 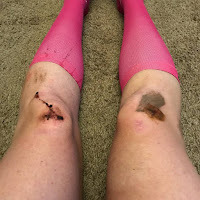 So I ran my slowest road 5k in years and felt like crap. Lead the F 5k the entire time, thought I won OA F, but the woman who won started far back and ran a faster time, so didn't cross the line before me. Lesson learned. Gotta feel out the first mile. Check. Still got a sweet medal, RUNdetroit gift certificate, and Mi Pueblo afterward with friends. WIN. 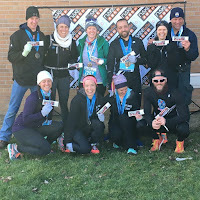 Strategic Staffing Solutions Turkey Trot 10k, Detroit, MI - 43:49. :05 10k PR!!! 5th in AG, 24th OA F. Okay, okay, I get it. No expectations = good race. I honestly was prepared to just run a good race. But man. That cold weather, flat course, crowds, Thanksgiving morning festivities, tradition with Jason, having people to chase, and the right song made for a good morning. 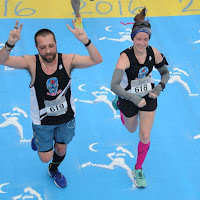 2016 - The ultimate goals are two full marathons and a BQ. Learning to race a little more aggressively and to believe I'm faster than I give myself credit for. 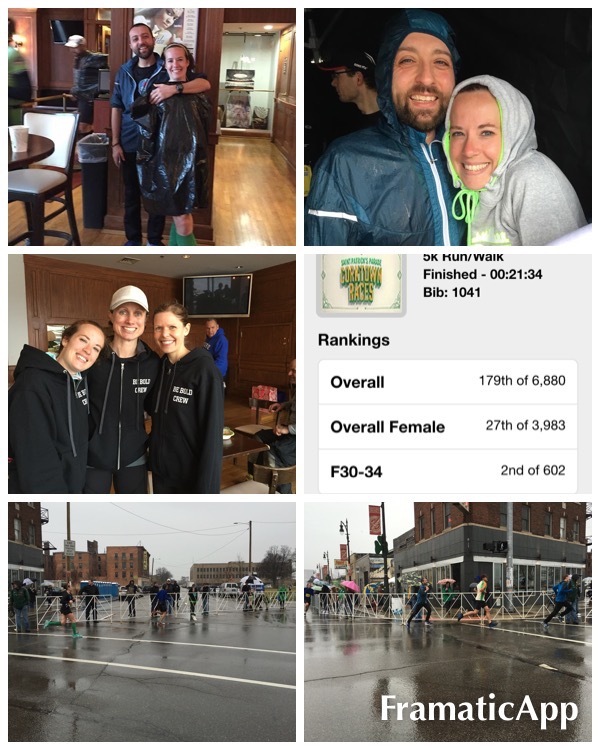 St. Patrick's Parade Corktown 5k, Detroit, MI - 21:34 - Badass points to EVERYONE who ran or walked this race in the pouring rain this year. 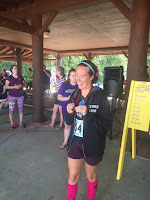 Second in my division (F30-34)! 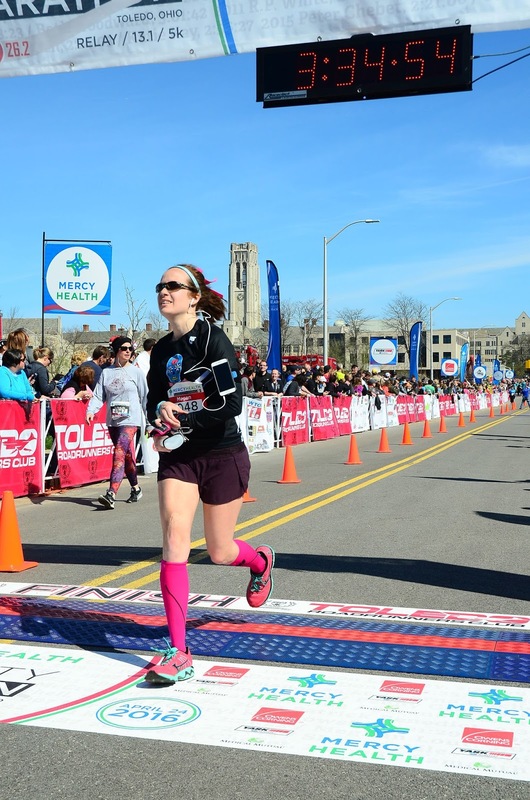 So far, full marathon training can still result in fast times in shorter distances. 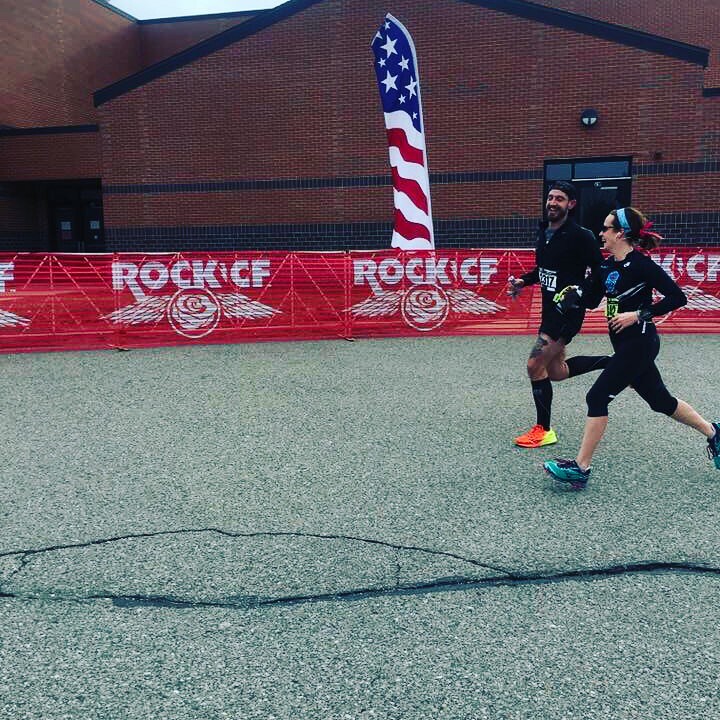 Rock CF Rivers Half Marathon, Grosse Ile, MI - 1:34:30 - The race where I decided to race aggressively, trust my training, and go for it. The result - a F30-34 division WIN and a 2 minute PR!!! Go for it, kids! What's the worst that can happen? Once again, an extremely well-executed race. Great course, not crowded, great crowd support. You get to run through an airport hanger! Nice weather (especially for Michigan in mid-March). Awesome race shirts, medals, and gloves and a sweet division win PEWABIC TILE! DELICIOUS cookies at the end, and everything supports the Rock CF Foundation. 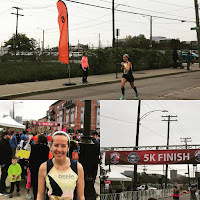 Allstate Sugar Bowl Crescent City Classic 10k, New Orleans, LA - 44:48 - This has always been on my list. I grew up in New Orleans, my dad used to run this race with his friends, and it's a major New Orleans event. Also, I got to register as a seeded runner with a qualifying time! Wow. Michiganders are NOT prepared to run in the humidity of New Orleans, no matter how often we "run inside at the Y in the heat." Just glad I got to be a part of the race. We had a blast. They throw one HELL of a post-race party. 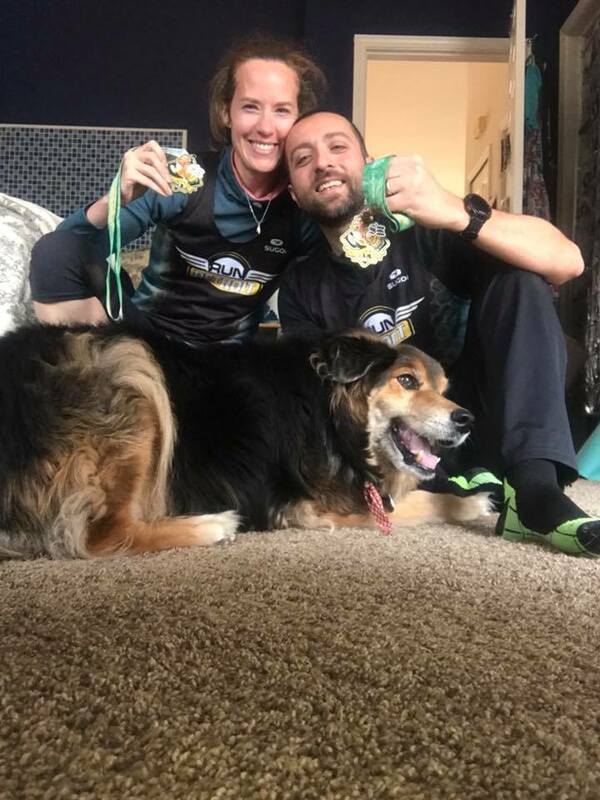 Mercy Health Glass City Marathon, Toledo, OH - 3:34:54 - My first full marathon and a BQ! With this being my first full marathon, I had a lot to write about. For a full review, click HERE. 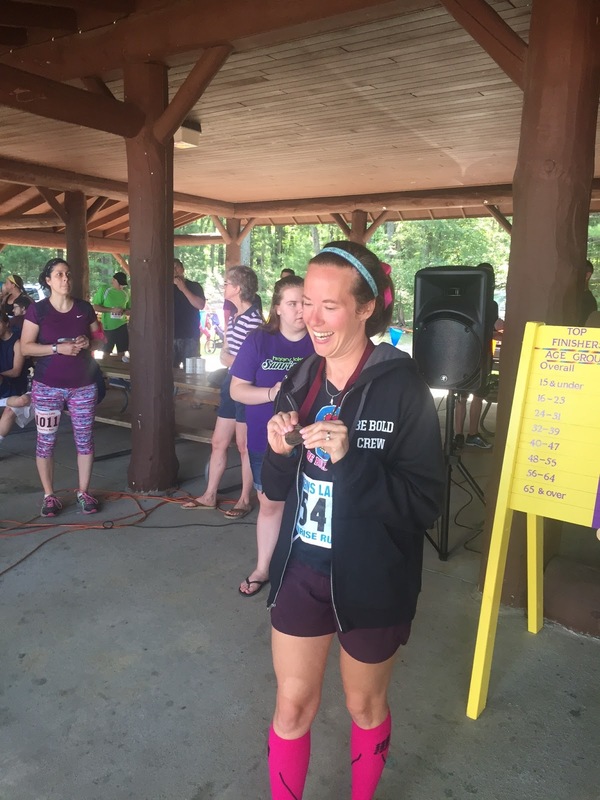 Higgins Lake Sunrise Run 10k, Higgins Lake, MI - 45:22 - First OA female and 4th OA! My strongest mental race. Not a PR based on time, but definitely a PR for mental toughness. Small field, so not a lot of people to chase. A couple of decent hills. Still adjusting to heat, humidity, and anemia, but powered through. 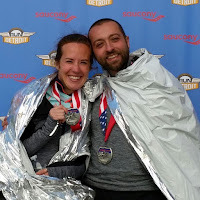 Detroit Free Press/Talmer Bank Marathon, Detroit, MI - 3:47:38 - Read my full race review HERE. 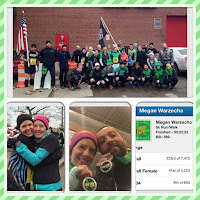 Great Lakes Endurance Treetops Trifecta Trail 13.1, Gaylord, MI - 1:58:13. 3rd female OA. A TOUGH race, but VERY fun! MAJOR elevation gain. Really technical trails. Lots of mud. GREAT people. BEAUTIFUL COURSE. 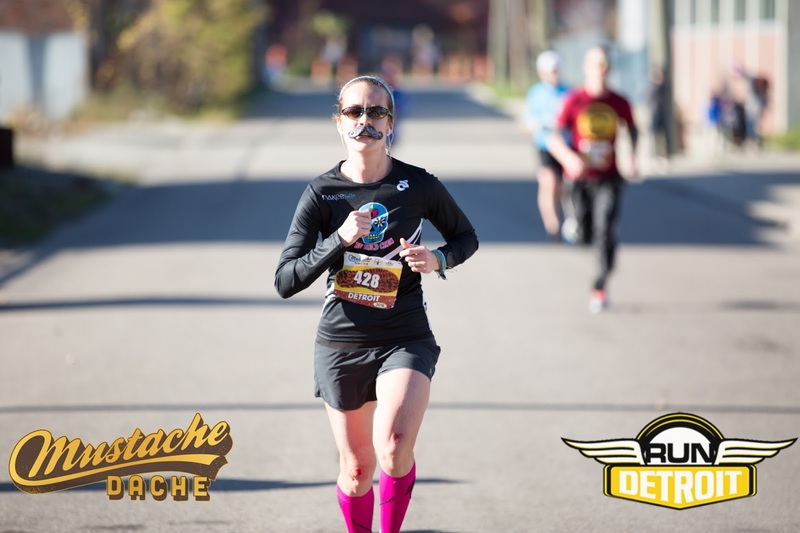 Mustache Dache 5k, Detroit, MI - 21:36 - 2 seconds off from my March time! What is that?! Weird. I did NOT feel like I was ready to run fast. This was a FUN race. SERIOUSLY. Who doesn't love running a 5k with a fake mustache glued to their upper lip? And RUNdetroit produces a great event. 2015 - The year of "Wow, okay, I can do this." 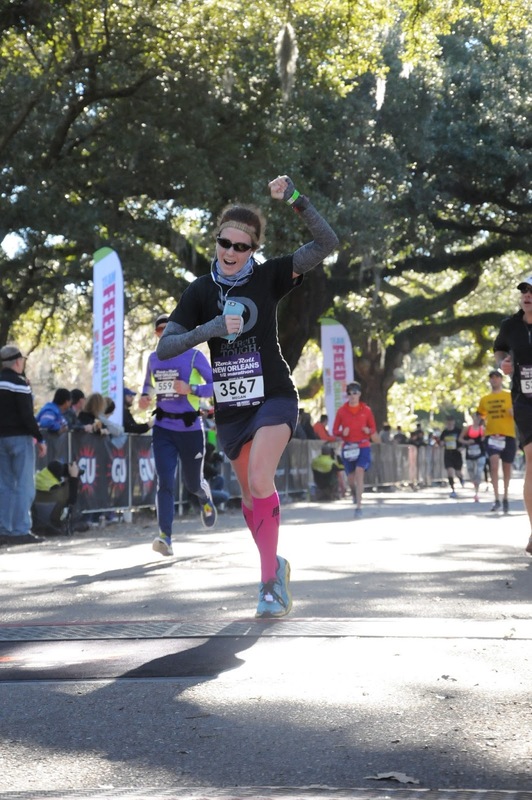 Rock'n'Roll New Orleans 13.1, New Orleans, LA - 1:45:17 - A 13 minute 13.1 PR. Not bad! Rock'n'Roll has their operations down. Highly recommend. Everything was easy from the expo to gear check to shuttle buses. St. Patrick's Parade Corktown 5k, Detroit, MI - 22:23 - Another great Detroit tradition. Just watch out for the smells of beer and fried food along the course! 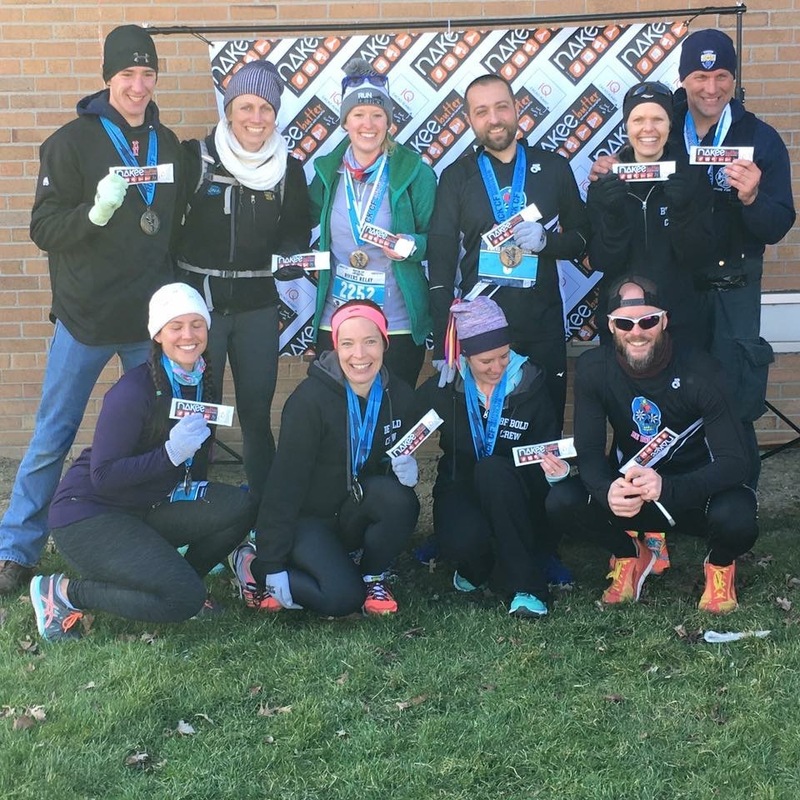 Rock CF Rivers 13.1, Grosse Ile, MI - 1:40:09 - A great race produced by a great woman for a great cause. I've run it once and I had a hell of a race, personally. Higgins Lake Sunrise Run 13.1, Higgins Lake, MI - 1:39:57 - This one was rough. Every runner is different and some people might love this course. I didn't love the constant hills and the pitch of the road. There wasn't much crowd support and they don't close down the road for the runners. On the other hand, it's fun to run from one state park to another, the weather is nice, and I had my first division win! Shrine Step by Step 5k, Royal Oak, MI - 21:36 - This small race supports Shrine, the school where I teach. 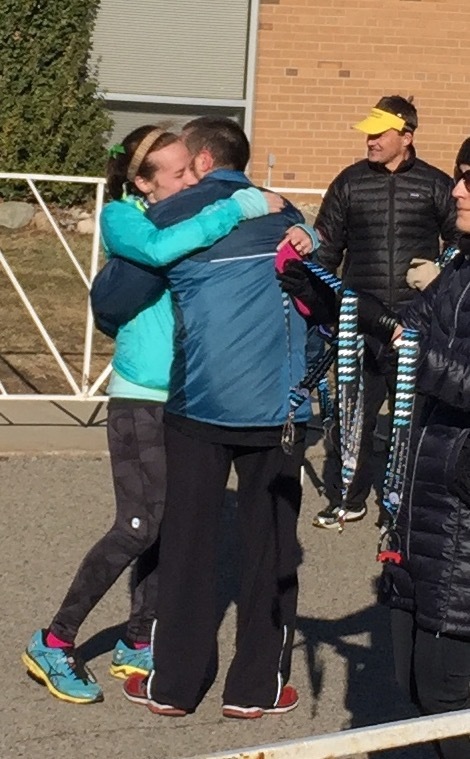 It's a lot of fun running with your students and their parents and cheering for them. Bonus, I snagged an all-time 5k PR (faster than high school cross country)! 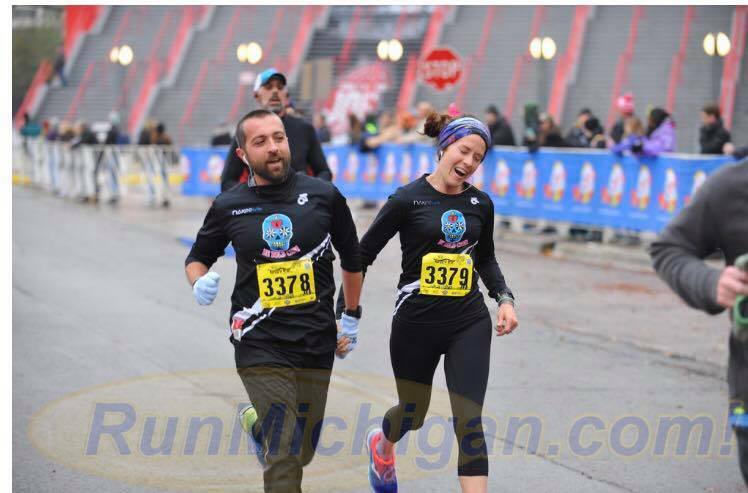 Detroit Free Press/Talmer Bank International 13.1 - 1:36:36 - See below for a full description of why I love this race so much. 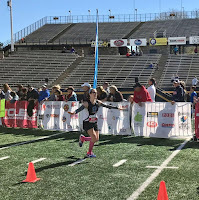 This was my fifth half marathon and a happy PR. I never thought I'd run ANY race at an average pace of 7:22, let alone 13.1 miles. This race made a Boston qualifier seem like a legitimate possibility. 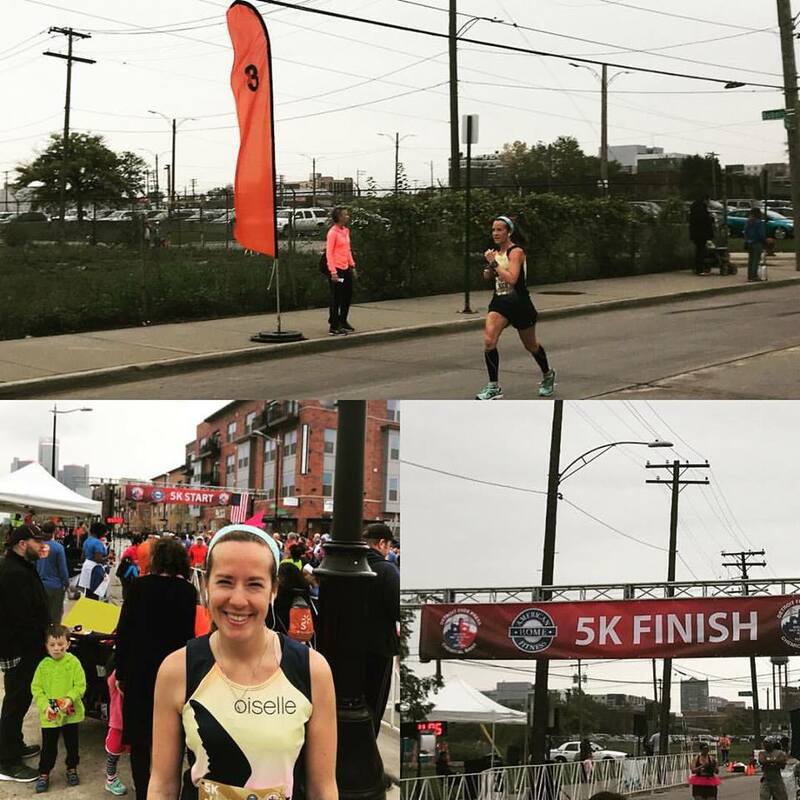 The Cocoa Classic 5k, Detroit, MI - 26:38 - I don't think this race is taking place in Detroit any more. There was a LOT wrong with the logistics of this race. If it was still taking place, we wouldn't run it. Higgins Lake Sunrise Run 10k, Higgins Lake, MI - 52:43 - Jason and I love spending time at our home up north. This race starts in South State Park and does a loop. It's actually a nice little race. Small field, limited crowd support, and you run on the shoulder of the road (roads aren't closed, but there's very little traffic up there). We're biased because it runs past our house and we can throw away our extra layers mid race. It's international. For pure coolness factor, how often do you get to say you raced in two different countries? Just remember that you have to carry your passport with you. Jason prefers the SPIbelt; I prefer the RooSport. You get to run over the Ambassador Bridge as the sun comes up. Humbling. Awe-inspiring. Just remember that you have to run back into the country through the Detroit-Windsor Tunnel. Not a race for people with a fear of heights, fear of confined spaces, or a felony. I actually saw someone get pulled over by the border police in 2014 because his bib wasn't visible. They were NOT messing around. AMAZING course. No joke. Not boring. You run through so many different districts that you're in mile 10 before you know it. Crowd support is fantastic. I thought Rock n Roll New Orleans would beat this race. It's RocknRoll, New Orleans, and my birth city. No dice. Freep won, hands down. Quantity and quality. Water stations. BOURBON AND BACON AT MILE 12! Detroiters have heart. We have grit. 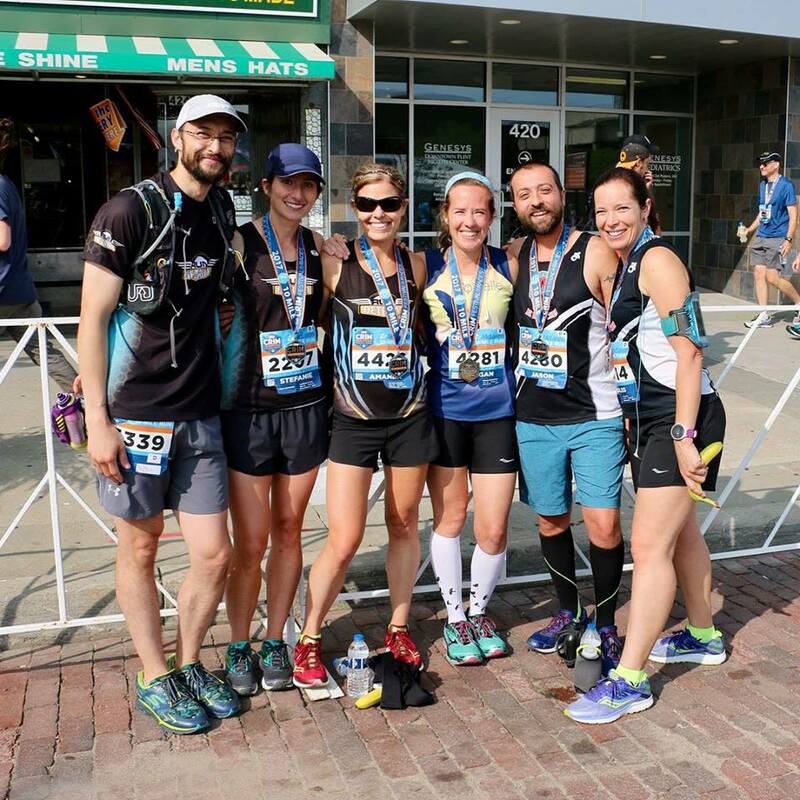 We understand what it takes to get out there and run 13.1 and 26.2. Expo is excellent. Awesome race-related gear. Awesome other gear. AWESOME course preview video done by RUNdetroit. Not TOO big, though. Great gear check. Close to the starting line. Easy to drop off and retrieve. It's my hometown race. How do you not feel all the feelings when you race in your home town? Detroit Turkey Trot 5k, Detroit, MI - 27:00 - Jason and I run this race every year, along with our Be Bold Crew. No better way to start a day where we celebrate family than by doing what we love with our running family. Fast and flat, and great crowd support!